Recent news reports about the ‘Wahhabi’ terror cell in the country have brought into open some level of ignorance among the so-called Malaysian intelligentsia about Islamic movement. On one hand such accusations reveal again the legendary close-mindedness of our government ulama; on the other hand, analysts and observers have been quick to condemn the accusations with some even coming to the defence of Wahhabism, little knowing about the historical and political issues underlying the subject. Thankfully, as much as such a controversy somewhat reveals our intellectual isolation from any present debate in the Muslim world, it also provides an opportunity to do our homework. Towards that end, this little book on Wahhabism, ‘Wahhabism: A Critical Essay’, written by British-American professor Hamid Algar of the University of Berkeley in California, who is one of the most well-known contemporary Muslim academics in the West, can serve as a good launchpad . ‘Wahhabism’ and ‘Wahhabis’ are names, often used derogatorily by those outside its fold, given to the doctrine and followers of Muhammad ibn Abdul Wahab, who, annoyed by practices which he claimed were bordering on kufr (disbelief of Islam), launched a campaign to ‘purify’ the Islamic faith. Many have compared the Wahhabi campaign to Islamic ‘reformation’ and ‘revivalist’ movements in various parts of the Muslim world. Professor Algar’s study of the Wahhabi phenomenon was published in 2002. It was considered timely then, coming after the rise and fall of the Taliban regime in Afghanistan, whose ‘Islamic’ rule few would deny was a carbon copy of the Wahhabi-Saudi rule in the Arabian peninsula. The difference between them is mainly that the former was destroyed because of its resistance to Western bullying, and the latter survives because of America’s interest in the region’s petroleum resources. The western media have labelled as ‘Wahhabis’ any jihad groups in Central Asia, and conveniently used phrases such as “strict Sunni Islam” or “puritan Islam” to describe the Saudi and the Taliban governments. But Wahhabism is not Sunni Islam; in fact many Sunni traditions have been attacked by the Wahhabis as shirk (polytheism) and bid’ah (un-Islamic innovations), the most common example of which is the celebration of the Prophet’s birthday. Most non-Wahhabis already have a general idea of Wahhabism even if they have not experienced it personally. Generally speaking, Wahhabis delight in polemics, have no patience with a second opinion, are often chauvinist in their interpretations, and usually peripheral in their approach. Anyone with a Wahhabi tendency is generally liberal in the use of strong terms such as bid’ah, kufr, aqidah, shirk and khurafat. Yet a tendency to label and condemn is not exclusive to Wahhabis. Numerous other pseudo-intellectual movements to “purify” Islam have emerged later, often claiming that Muslims have deviated for “hundreds of years”, only to be offered salvation by these ‘purified’ understandings of theirs, as if Islam’s built-in system of deviation and correction is inadequate. One can safely name in this category the ‘gold dinar’ advocates and the anti-Hadith followers, both from opposite extremes but identical in their approach and thinking method: one obsessed with monetary issues, the other with weak hadiths (traditions of Prophet Muhammad). Any movement that does not have an intellectual foundation may be doomed to fail, especially when it seeks to interpret and offer guidelines for a revealed paradigm. One may be forgiven for thinking that the movement of Muhammad ibn Abdul Wahhab emerged out of a scholastic tradition, from the fact that Wahhabism has grown from its small localised beginnings to encroach into the minds of many Muslim individuals and groups from Indonesia to Europe. Historical honesty demands that we admit that this in itself is some success. True, Wahhabism may not be pursued with the same vigour today as it was during its early days, yet its influence on the Muslim world is undeniable. In the West Muslims may have encountered Wahhabi tendencies among the more idealistic youngsters, who are influenced through Saudi-sponsored Muslim fraternities such as the Muslim Student Associations, the Muslim World League, the World Assembly of Muslim Youth (WAMY), and an array of academic institutes and publication houses. In the East the Wahhabi success story is much shorter, although the Saudis have funded Muslim youth organisations in the Indian subcontinent and south-east Asia. The Jamaat Muslimin group in India and the Muslim Youth Movement of Malaysia (ABIM) are examples.However, it would be grossly unfair to dismiss these organisations as Wahhabi set-ups. Social, cultural and financial circumstances have made these unsuspecting groups embrace Saudi-Wahhabi assistance. In much of India and the Malay world it is admitted even by the most anti-Wahhabi that many unIslamic beliefs and practices have penetrated local Muslim traditions; various forms of Wahhabism have offered that radical ‘cleaning up’ drive that local ulama have not been able to provide. Some even try to justify the Wahhabis’ ‘historical terrorism’ in the Arabian peninsula, destroying places of historical importance, such as libraries and graves of the Companions of the Prophet. Whether all this is done with sincere Wahhabi sentiment is highly doubtful, as Algar notes: the palaces of the Saudi monarchs have somehow escaped the Wahhabis’ ‘purification’. The Saudis’ Islamic programmes are conducted in the hope of acquiring political legitimacy within the Ummah by propagation of Islamic tenets, albeit with questionable interpretations. The end-products of such programmes are at best an intellectual exercise for Islamic studies graduates. One example is the so-called revised version of Abdullah Yusuf Ali’s famous translation of the Quran. Years of effort by Wahhabi-minded scholars have resulted in a distorted version of the original work , with all commentaries or terms bordering on tasawwuf (Islamic mysticism)- which is ‘innovation’ according to the Wahhabis – omitted. One interesting comment by Algar is his rejection of the theory that Wahhabism had a scholarly origin. He points out that Muhammad ibn Abdul Wahhab had no foundation, intellectually or spiritually. A cursory glance at some of the Wahhabi writings and reference materials does show a lack of research and intellectual honesty. Many of these books, as he observes, are merely collections of hadiths on different subjects. Perhaps in jest, Algar argues that the birthplace of Wahhabism is enough for us to view its doctrines with suspicion, mentioning an “apocalyptic hadith” about Najd in central Arab peninsula being unfavourable compared with other regions in terms of divine blessings. He adds: “Correlating apocalyptic hadith with observable historical phenomena is a hazardous task, best left unattempted, and this particular hadith, if indeed authentic, may ultimately be seen to have a sense entirely unconnected with Wahhabism” (pp. 5-6). Using the works of Orientalists and Arab Muslims, Wahhabis as well as non-Wahhabis, he argues that the final feather in Wahhabism’s cap was the founding of the Kingdom of Saudi Arabia. Algar’s explanation of the early rise of Wahhabism is also useful to understand the rise of the Saudi dynasty in the Arabian peninsula and how the colonial powers, namely the British in this case, used such groups in order to remain effectively entrenched in territories long after they ‘leave’. These are historical facts, but what the writer seems to have missed is the fact that the Wahhabis even in their early days were not very different from their modern counterparts, such as the Taliban. Followers of Wahhabism may have been unprepared for, and ill-equipped to deal with, the intricate and devious manoeuvres of the British. Could it not be that these unsuspecting followers were used by Britain because of this lack of sophistication on their part? Having given an overview of Wahhabism, Algar explains the various activities of the Saudis, using their oil wealth, to propagate the Wahhabi creed to the rest of the Muslim world, through the organisations mentioned above. While not much success can be conceded to Wahhabis in Muslim countries, the fact is that the Wahhabi ‘ideology’ has been spread vigorously among Muslims in the West. In the meantime, he also dismisses the Western propaganda of the Wahhabis’ so-called influence in the Caucasus and Central Asia. The last part of the book deals with the Shi’ah response to Wahhabism. Were it not for the fact that the Shi’ite Muslims have been at the receiving end of the Wahhabi onslaught, the subject would have been better ignored. One of the Wahhabis’ primary targets were the Shi’ahs in the Holy Lands, and fatwas were issued by Wahhabi scholars condemning them and saying that their blood may be shed. Algar then fast-forwards to the contemporary Wahhabi position on Shi’ism, and how those opposed to the Saudi dynasty continue to echo Wahhabi sentiments despite their criticism of Muhammad ibn Abdul Wahhab because of his alliance with the Saudis. Other Wahhabi-minded dissidents have been more accommodating, and prefer to be among the more ‘diplomatic’ (by Wahhabi standards) cousins of Wahhabis, called Salafis, so called after the generation of ‘Salafs’: the generation of the Prophet and the four Caliphs after his death. Algar, however, warns us of the tendency of the people whom he calls “professional anti-Wahhabis” to accuse of Wahhabism any who do not subscribe to their own political and religious views. The Salafis, and those for whom the cause of Palestine is a high priority, for example, are some of their victims in America. He writes: “No doubt the Salafi mode of thought has many adherents, and no doubt it has many points in common with Wahhabism… however, it is inaccurate, irresponsible, and dangerous-particularly in the climate of the post-September 11 America-to conflate ‘Salafi’ with ‘Wahhabi’ and paint a picture of American Muslims as being in their majority Wahhabi” (pp 67-68). The book ends with some selected writings by Muhammad ibn Abdul Wahhab and his followers, and a Shi’ah response to Wahhabism in the form of a letter by Shaykh Ja’far Kashif al-Ghita to Abdul Aziz bin Muhammad bin Saud, refuting the Wahhabis’ many accusations of shirk and kufr against Shi’ism. Algar’s essay on Wahhabism is perhaps the strongest indictment of the divisive sect by a contemporary Muslim academic in the West, one who is highly respected for his depth of scholarship. Yet it would be unwise to brand such groups as being outside the fold of Islam, and Professor Algar is careful not to do so. It is imperative that Muslims be warned of such a dangerous creed within Islam. Yet it is more productive to seek common ground with such groups and engage them within the Islamic movement, instead of wasting energy on countering their claims. The truth is that supporters and opponents of Algar’s views on Wahhabism may be surprised to find their differences made irrelevant by the common enemies of Islam. Posted in Book Review, Politics, Religion. COMMENT After weeks of silence during which he took a lot of flak for what was perceived as undue coziness with the powers-that-be, the Catholic Archbishop of Kuala Lumpur, Reverend Tan Sri Murphy Pakiam has issued a statement on the establishment of diplomatic relations between the Vatican and Malaysia. Couched in the platitudes for which men of the cloth are renowned, the statement by Reverend Murphy Pakiam, given front-page play in today’s edition of the Catholic weekly Herald, sets out six steps that he hopes would be facilitated by the establishment of diplomatic relations between the Holy See and Malaysia. There is a lack of realism about the majority of the steps the Archbishop spelt out that is either a commentary on the dangers posed by thinking that revels in platitudes, or it simply reflects imperviousness to what the environment is telling him. Take, for example, hopes for the establishment of an Inter Religious Council that would include key leaders and representatives of all religious groups. The operative word here is “key”. Muslim supremacy is not going to abide the notion of implied parity to other religions that membership of an inter-faith panel by key Muslim leaders would grant. This fact ought to have been plain to non-Muslims a long time ago when Muslim religious leaders declined invitations to join the Christian-mooted Malaysian Consultative Council of Buddhism, Christianity, Hinduism, Sikhism and Taoism formed in the early 1980s. If it didn’t get through in earlier decades, this fact should have last year after no less than the Deputy Prime Minister Muhyiddin Yassin dismissed the composition of the inter-faith panel that the late Ilani Ishak tried to form as “small fry”, in an apparent attempt to placate Muslim supremacists who were upset at Muslim participation. In Muslim-dominated Malaysia, Islamic propriety towards The Other does not disbar cordiality, but it stops short of countenancing the notion of equality. A Ministry on non-Muslim affairs? Similarly unrealistic is the second step outlined by the Archbishop: the establishment of a ministry and the appointment of a full minister to look into non-Muslim affairs. Again, this measure would grant parity to other religions and so would be insupportable in a Muslim-run polity. In its favour, one may argue that there exists such a portfolio in other Muslim dominant countries like Pakistan, for example. The third step is one that is the most feasible because it does not have any negative repercussions on the special status of Islam in Malaysia. This step concerns the establishment of dialogue and links between Islamic institutions in Malaysia and the Pontifical Institute for Arabic and Islamic Studies. But the fourth and fifth steps deepen the unrealism that drapes the whole project of what ties between the Vatican and Malaysia should achieve from the standpoint of the church in Malaysia. These measures concern education and training. The Archbishop hopes that the government would permit seminaries to resume the training of priests from the region, and that it would promote Christian-Catholic education and training of teachers. It is not hard to envisage that a Muslim-run government would respond with a flat ‘no’ to the first request and a nuanced ‘yes’ to the second. A Muslim government, zealous about its Islamic credentials, would be averse to the idea of Malaysia being a hub for the training of priests from the region. However, the same government would not be unfriendly to the proposal that Christian principals be appointed to Christian-owned but government-aided educational institutions. The sixth step concerns the promotion and defence of democratic values and protection of minority groups in Malaysia. This step is neither here nor there. Its feasibility depends on who makes the government in Malaysia. The best way to ensure the realisation of the sixth step is to abet the development of political perspectives in Malaysia that aim to restore the country to the values enshrined in the Merdeka Constitution. Restoration would foster a climate where the less unrealistic goals outlined by the Archbishop are certain to be realised. Absent restoration, those goals would be subject to the vagaries of rulers who will treat the Christian vote as a thing to be courted only when their tenancy is imperiled. Posted in International Affairs, Najib, Politics, Religion. 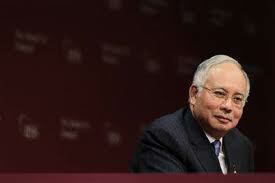 As a result of the developments on July 9, the world is now paying increased attention to Malaysia. In particular, we now wonder how free and fair your nation’s elections are. We have learned that some of your country’s citizens believe that Malaysia needs electoral reform. 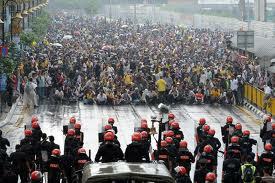 On July 9, they marched with a coalition called Bersih 2.0, and they called for free and fair elections. You responded by declaring Bersih illegal and suppressing the ‘Walk for Democracy’ with overwhelming Police force. 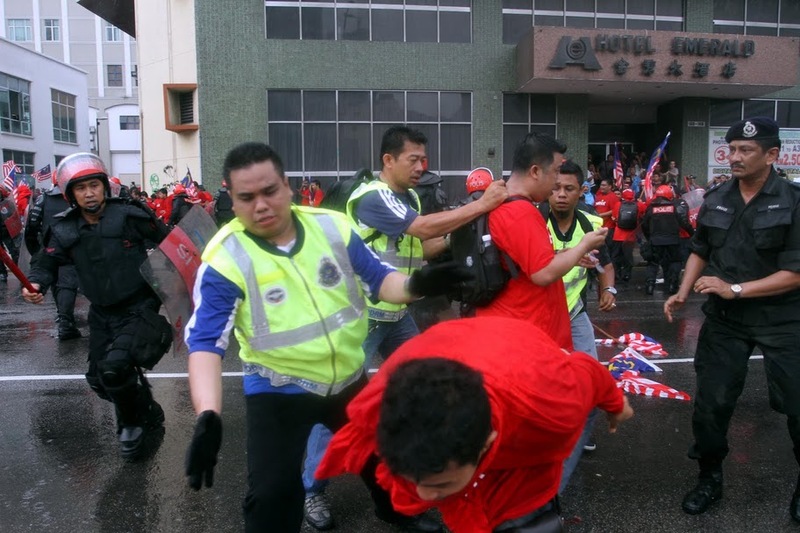 The world noticed your heavy-handed reaction, and it wondered why a peaceful demonstration calling for fair elections bothered you so much – so much so that you were willing to risk Malaysia’s international reputation – and give your country and yourself a major black eye. When you returned from your visit to Europe, you declared that Malaysia’s elections truly are free and fair, and that UMNO has never cheated in any election. I am glad to hear that. Because it means that in Malaysia’s next general elections, you have nothing to hide. Governments that manipulate elections have lots to cover up. But you say that your elections are free and fair, so that means you have nothing to be afraid of showing to all of us in the outside world, not to mention your own people. 1) Allow international groups to observe your elections. Based on your assertions, they will find nothing amiss, and their reports will give credibility to Malaysia’s election results. 2) Allow observers from all political parties to witness the postal balloting that takes place on military bases. For years, the opposition has said that something is amiss. But since you say that UMNO never cheats, I am sure that they will find nothing wrong, and you will be vindicated. 3) Let’s put an end to all the accusations about phantom voters by using a simple, effective and cheap solution – indelible ink. Your Elections Commission wants a super-sophisticated biometric system, but there is no way it can be in place by then – and many people worry that it can be manipulated. Indelible ink works – just ask the world’s largest democracy, India. I don’t think anyone has ever disputed the results of India’s elections in over 60 years. 4) Finally, let RTM be truly independent, like the BBC and NHK and the public broadcasting systems in Australia, France, Germany, and elsewhere in the world. RTM does not belong to UMNO. It belongs to the people. As long as RTM – funded by all the people of Malaysia – acts as the propaganda arm of the 25 percent of Malaysians who voted for UMNO, no one can believe that Malaysia’s elections are fair and free. So, my dear Prime Minister, it’s all very simple. You say that Malaysia’s elections are free and fair. Now you have a chance to prove it to the outside world and remove all doubts. And if your party wins, then the Malaysian people – and the world – might finally be convinced. If you refuse these suggestions, then the doubts will linger, and your assertions about the honesty of Malaysia’s election will continue to be questioned. Dr. Kamsiah and I are saddened to learn early this morning of the passing of a dear friend, Dato’ Syed Ahmad Jamal. 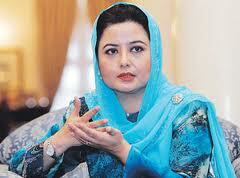 We wish to express our most profound condolences to Y.Bhg Datin Hamidah Md Noor and family. 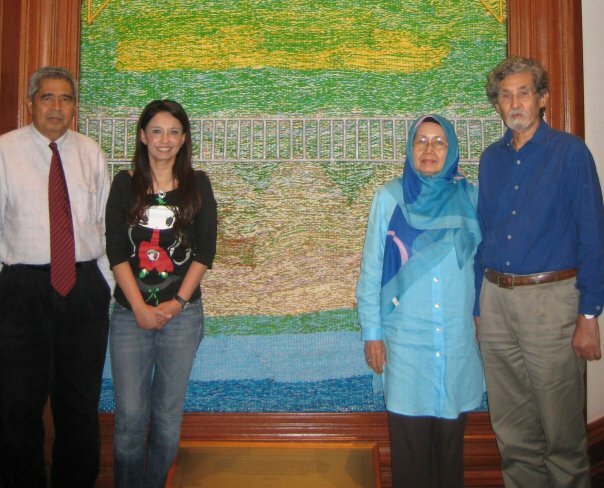 We had looked forward to meeting Dato’ Syed Ahmad Jamal and Datin Hamidah again on August 18, 2011 at the KL Lifestyle Gallery, Jalan Ma’arof, Bangsar Baru, Kuala Lumpur. It has been quite a while since we met this loving and devoted couple at Balai Seni Lukis Negara (see picture above). 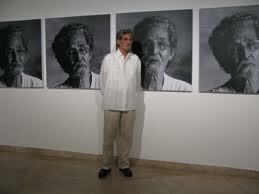 He was a dear friend to us, and a respected intellectual with a number of books on Art and Art History to his credit. 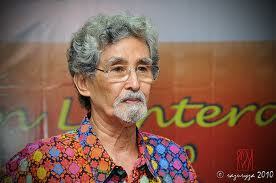 National Art Laureate 1995 Dato’ Syed Ahmad Syed Jamal died at his residence in Gombak here at about 10pm tonight. He was 82. He is survived by his wife, Datin Hamidah Mohd Noor and two sons. 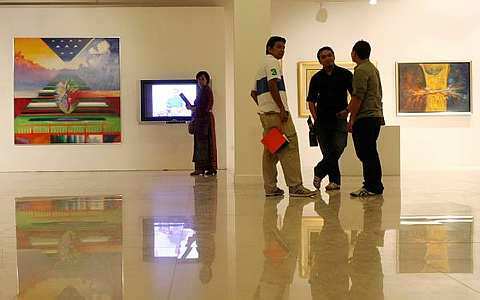 His death was confirmed by the National Art Gallery’s Public Relations Unit when contacted by Bernama. Born in Muar, Johor, Syed Ahmad received his early education at Sultan Abu Bakar English College, Johor Bahru. 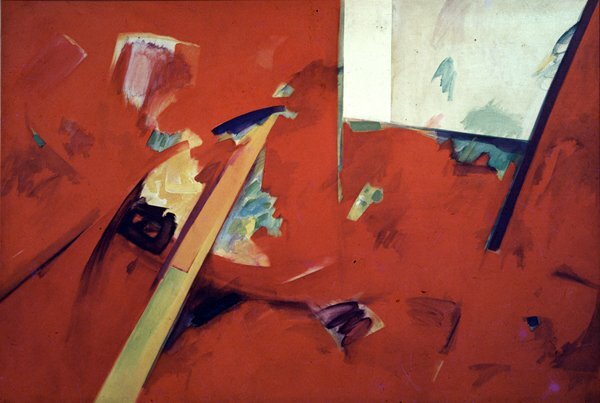 His higher education was gained abroad – Birmingham School of Architecture (1950-1951), Chelsea School of Arts, London (1951-1955), Institute of Education, University of London (1955-1956), School of Art Institute, Chicago (1963-1964), a masters degree from University of Hawaii (1973-1975). Syed Ahmad had served as Universiti Malaya director of cultural centre (1979-1982, a lecturer at the Malayan Teachers Training College, Kirkby, England (1958-1959) and director of the National Art Gallery (1983-1991). 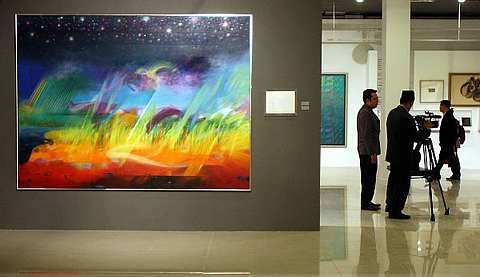 He had won accolades and art prizes locally and internationally. Syed Ahmad will be buried at the Kampung Pusu Muslim Cemetery, Gombak before Zohor prayer tomorrow (July 31, 2011). Dalam memperkatakan dan melihat hasil karya SAJamal, kita terpesona akan kehebatan beliau dalam mengolah serta memainkan warna dan bentuk-bentuk tiga segi yang berpaksikan semangat ‘fiction’ kisah lagenda puteri gunung Ledang, Gunung Fujiyama dan sebagainya. 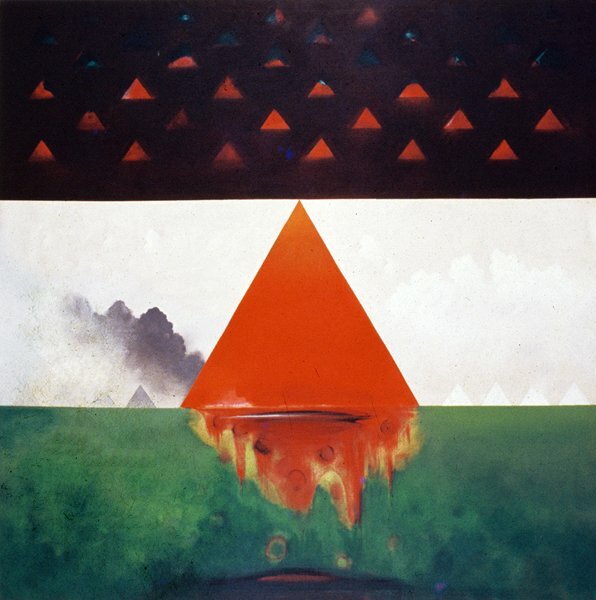 Disamping memaparkan unsur jiwa keislaman dalam tampak wadah ‘contemporary’, sebagaimana kenyataan beliau “My works have an Islamic soul and a contemporary form.” – Syed Ahmad Jamal – (Ooi Kok Chuen, 2009 Sunday Times). Antaranya juga, Syed Ahmad’s landscape and (early) portrait paintings were stamped with his personal input and style, with traces of analytical Cubism and Abstract Expressionism, before his art matured into a kind of sublimal Symbolism. Terutama semasa beliau memulakan langkah awal sebagai ‘Specialist Teachers Training Institute as principal (1965-73) before he did his master’s in Art History at the University of Hawaii, Honolulu, in 1973. 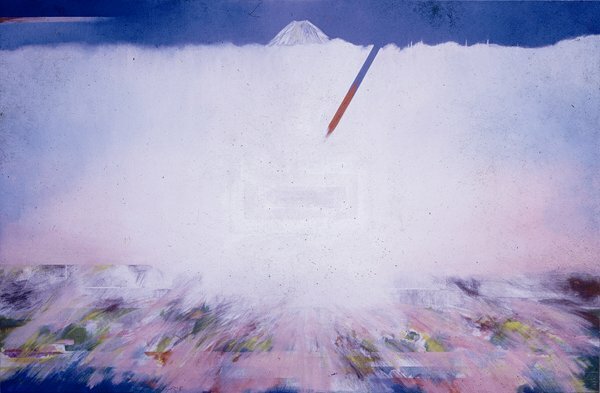 He studied Philosophy in Islamic Art at Harvard in 1974 and that led to the subtle infusion of Islamic elements in his art, helped in part by the resurgence sparked by Ayatollah Khomeini in the early 1980s. Examples of such works are Tawaf (1986), Ruang Qiblat (2004) and Arafah (1999). (Ooi Kok Chuen, dalam SundayTimes Oct 4, 2009). Beliau telah didedahkan dengan pendidikan dari dunia barat iaitu di Britain, at the Birmingham School of Architecture (1950) and the Chelsea School of Art (1951-55) dan di Amerika Utara “where he studied sculpture at the School of the Art Institute of Chicago, from 1963 to 1964. There, he was struck by the works of Clyfford Still (1904-80), Mark Rothko (1903-70) and Hans Hoffmann (1884-1966) (Ooi Kok Chuen dalam Sunday Times, October 4, 2009). Berlandaskan akan latarbelakang tersebut sudah pasti beliau mempunyai pengalaman luas dalam selok belok senilukis samada pada peringkat negara dan antarabangsa. Retrospektif beliau kali ini merupakan kemuncak kerjaya senilukisnya sebagai seorang seniman yang begitu komited mengenai visi seninya. Walaubagaimanapun, apa yang tertariknya di sini, saya ingin mengambil akan ungkapan Ismail Abdullah bahwa jika melihat karya SAJ adakah kita menikmati kepuasan daripada bentuk dan warnanya yang garang dan berseri sahaja? Sebagai contoh, sebuah karya lukisan SAJ Gunung Ledang, walaupun dalam bentuk abstrak. Namun memiliki simbol melalui warna dan bentuk geometri yang cuba dikaitkan dengan legenda puteri gunung ledang di Melaka. Lukisan abstrak ini mempunyai elemen visual yang menyatakan pandangan pelukisnya melalui aspek tampakan yang diadun secara halus dan bijaksana. Kenyataan Ismail Abdullah (IA) membawa kepada persoalan yang jelas mengenai penggunaan kodifikasi serta pemaparan representasi SA Jamal mengenai seni yang ingin dibawanya. 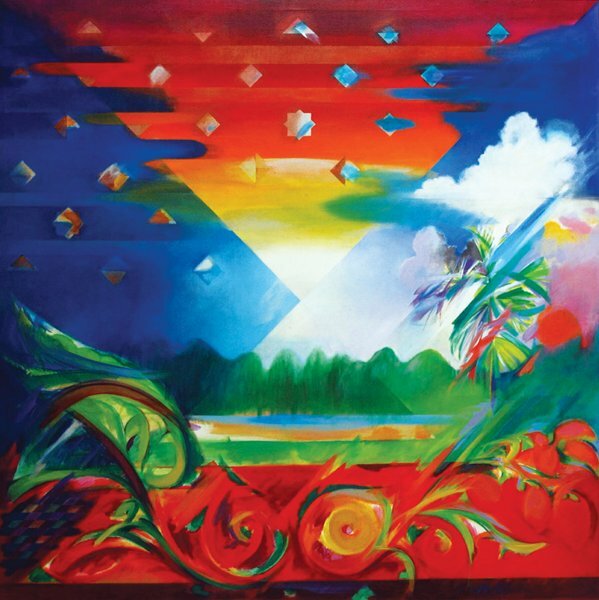 Mengikut SAJamal, “As a painter, I want to capture the essence and immortalize it in painting.” Soalannya, bagaimana beliau membina permasalahan ‘the essence’ dalam suatu permukaan catan yang terhad, daripada suatu lagenda melayu yang besar. Adakah ‘the essence’ yang diucapkan oleh beliau hanya sekadar membina fakta-fakta teks yang berlambangkan bentuk tiga segi (gunung) yang diimaginasikan dapat membina sebuah naratif visual yang tepat? Benarkah fakta-fakta teks visual tersebut bersifat begitu? Kalau benar, bagaimana fakta teks dari filem Puteri Gunung Ledang, karya Tiara Jacquelina dengan simbol visual yang dimainkan oleh SAJamal. Apa lebih dan apa kurangnya, sebagai suatu karya visual? Adakah karya maha agong SAJamal berupaya membina sejarah seninya berbanding cereka Tiara dalam wadah visual yang lebih efektif? Adakah sudah cukup lambang-lambang yang digunakan SAJamal sebagai suatu essence bagi keseluruhan penceritaan teks melayu yang besar itu? Tetapi apa yang dapat dilihat dari rencana visualnya, SAJamal begitu mahir dalam memercikan lapisan pelbagai warna-warni dalam dimensi formasi visual yang boleh dianggap sebagai ‘immortalize’ pada setiap karyanya. 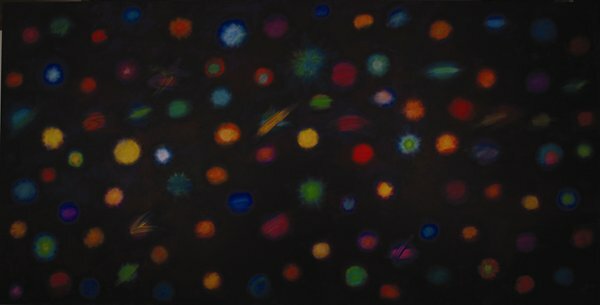 Mungkin dalam kaedah ini beliau berjaya, terutama dalam karya beliau yang awal, kerana pengaruh Rothko.M, Clyfford Still dan Hans Hoffmann begitu jelas diadaptasinya sebagai suatu perencanaan visual seperti catan Jendela di Angkasa (1969). Warna sebagai subjek yang meliputi seluruh ruang kanvas berjaya menangkap perspeksi dalam formasi kotak empat segi melintang, lantas membentuk perimbangan visual serta dilorek dengan fragmen-fragmen yang terapong memberi ‘myth’ dan tanda tanya secara saikologikal, seperti Rothko dan kawan-kawanya dalam aliran abstrak ekspressionisme. Mungkin dalam kontek ini SAJamal berupaya membawa aliran tersebut kedalam jiwanya dan mampu diterjemahkan sebagai seorang melayu! Tetapi dalam bahasa yang lebih universal. Sebagaimana kenyataan beliau, “I found American paintings bolder and of a larger scale, and they have no reference to any discernible objects, like a tree. It was ground-breaking, not only in terms of size, but I was able to handle the space. I managed to overcome the fear of (big) space, and juggled to find a balance between forms and space,” (Ooi Kok Chuen, 2009). Namun apa yang kita dapati daripada kenyataan nya, beliau seolah masih berpegang kepada aturan bentuk mujarad yang diadunkan secara formal. Kejelasan beliau mengenai kodifikasi fragmen-fragmen mujarad tersebut masih tidak jelas samada dalam konteks abstrak ekspressionismenya atau jiwa melayunya, terutama nada islam yang dijelaskan. 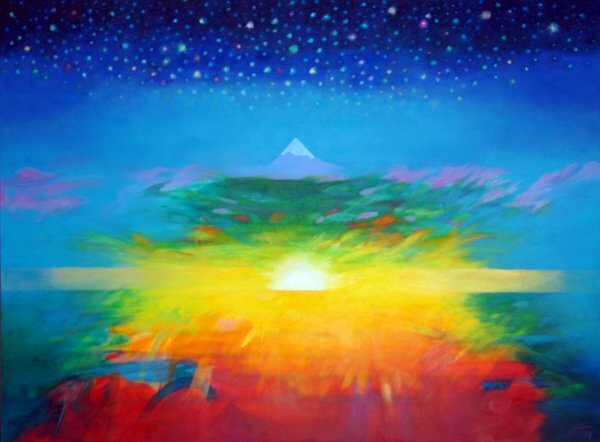 “My works have an Islamic soul and a contemporary form.” (Ooi Kok Chuen, 2009). Bagaimana beliau menterjemahkan tanda-tanda tersebut, lebih-lebih lagi dalam cerekarama visualnya melalui siri-siri Gunung Ledangnya? Bagaimana pula semangat beliau dalam teks Rupa dan Jiwa dalam hal ini? Adakah teks tersebut hanya sekadar sebagai suatu dokumentasi objek sejarah yang mengagongkan rupa bendanya sahaja atau daripada rupa jiwanya? Lebih lagi dalam kaitan beliau pada aliran Abstrak Ekspressionism? Bagaimana SAJamal melihat akan perkara tersebut? Terutama dalam nada kontemporari yang diucapkan? Apa bezanya karya beliau yang dahulu kepada yang terkini. Adakah SAJamal masih mahu meretrospektif dalam gaya yang serupa? Almost three weeks after the Bersih 2.0 rally, the debate continues unabated with a key member of royal family claiming today that the electoral reform movement “had in some way been hijacked” by other groups and individuals. Johor Sultanah Raja Zarith Sofia Sultan Idris Shah (left), said though the original cause of Bersih rally was genuine, the movement had been taken over by others. “They had in some way been hijacked by other groups and individuals… the original idea about general elections and the transparency of general elections were lost,” she said. She was fielding a question from a student after officiating the 5th Annual Malaysian Student Leaders Summit at the Kuala Lumpur Hilton this morning. Raja Zarith Sofia, who is also the chancellor of Universiti Teknologi Malaysia, advised the students against completely believing in media reports on the Bersih rally. Instead, she said they should decide on their own on what is right or wrong and try to grasp as much as they can on current events in the country. “Of course, you can see from the mainstream media that perhaps Bersih is founded by wrong people and the bad guys, and other groups are the good guys. She also said the Bersih rally organisers may have been influenced by the Arab Spring in the Middle East but claimed that the scenarios are different between the two events. To another question on the nation’s education system, the Johor Sultanah commented that Malaysia should abolish the vernacular school system. This, she explained, is because Chinese and Tamil school students do not possess a good command of the English language to communicate with foreigners. “Ideally, ridding vernacular schools would be a very forward-looking move,” she said, adding that this was her personal view.